Inside every person is a skeleton, a sturdy framework of 206 bones. The skeleton protects the body's organs, supports the body, and provides attachment points for muscles to enable body movement. 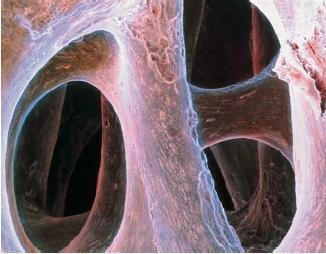 Bones also produce blood cells and act as a storage site for minerals such as calcium and phosphorus. All humans are born with over 300 bones. But some bones, such as those in the skull and lower spine, fuse (join together) during growth, thereby reducing the number. The skeletal system is made up of living material, with networks of blood vessels running throughout. Living mature bone is about 60 percent calcium compounds and about 40 percent collagen (a fibrous protein). Hence, bone is strong, hard, and slightly elastic. Although mature bones consist largely of calcium, most bones in the human skeleton began as cartilage. Cartilage is a type of connective tissue that contains collagen and elastin fibers. Individual bones meet at areas called joints and are held in place by connective tissue. Cartilage lines the surface of many joints and helps reduce friction between bones. The connective tissues linking the skeleton together at the joints are ligaments and tendons. Both are made up of collagen, but serve different functions. Ligaments link bones together and help prevent dislocated joints. Tendons link bone to muscle. Because the bones making up the human skeleton are inside the body, the skeleton is called an endoskeleton. Some animals, such as the crab, have an external skeleton called an exoskeleton. The human skeletal system is divided into two main groups: the axial skeleton and the appendicular skeleton. The axial skeleton includes bones associated with the body's main axis, the spine. This includes the spine, the skull, and the rib cage. The appendicular skeleton is attached to the axial skeleton and consists of the bones associated with the body's appendages—the arms and legs. This includes the bones of the pectoral girdle (shoulder area), the pelvic girdle (hip area), and the arms and legs. Axial skeleton. There are 28 bones in the skull. In adults, the bones of the cranium (part of the skull that encloses the brain) are flat and interlocking at their joints. In infants, cartilage fills the spaces between the cranial bones. Known as soft spots or fontanelles, these spaces allow the skull bones to move slightly during birth. This makes birth easier and helps prevent skull fractures. Eventually, the fontanelles are replaced by bone. In addition to protecting the brain, skull bones also support and protect the organs responsible for sight, hearing, smell, and taste. The skull rests atop the spine, which encases and protects the spinal cord. The spine, also called the spinal column or backbone, consists of 33 stacked vertebrae, the lower ones fused. The spinal column helps to support the weight of the body and protects the spinal cord. Disks of cartilage lie between the bony vertebrae of the back and provide cushioning, like shock absorbers. The vertebrae of the spine are capable of only limited movement, such as bending and some twisting. Twelve pair of ribs (a total of 24) extend forward from the vertebrae of the upper back. Most of the ribs (the first seven pair) attach in the front of the body via cartilage to the long, flat breastbone, or sternum. These ribs are called true ribs. The next three pair of ribs, called false ribs, do not attach to the sternum. They are connected by cartilage to the ribs above them. The lower two pair of ribs that do not attach in the front are called floating ribs. Ribs give shape to the chest and support and protect the body's major organs, such as the heart and lungs. The rib cage also provides attachment points for connective tissue, to help hold organs in place. Appendicular skeleton. The appendicular skeleton joins with the axial skeleton at the shoulders and hips. Forming a loose attachment with the sternum is the pectoral girdle, or shoulder. Two bones, the clavicle (collar bone) and scapula (shoulder blade) form one shoulder. The major advantage to the loose attachment of the pectoral girdle is that it allows for a wide range of shoulder motions and greater overall freedom of movement. Unlike the pectoral girdle, the pelvic girdle, or hips, is strong and dense. Each hip, left and right, consists of three fused bones—the ilium, ischium, and pubic. The pelvic girdle is bowl-shaped, with an opening at the bottom. In a pregnant woman, this bony opening is a passageway through which her baby must pass during birth. The pelvic girdle of women is generally wider than that of men, which helps to ease birth. The pelvic girdle protects the lower abdominal organs, such as the intestines, and helps supports the weight of the body above it. The arms and legs, appendages of the body, are very similar in form. The upper arm bone, the humerus, is the long bone between the elbow and the shoulder. It connects the arm to the pectoral girdle. In the leg, the thigh bone, or femur, is the long bone between the knee and hip that connects the leg to the pelvic girdle. The humerus and femur are sturdy bones, especially the femur, which is the longest bone in the body. At the elbow the humerus attaches to a set of parallel bones—the ulna and radius—the bones of the forearm. These bones attach to the eight small carpal bones of the wrist. The hand is made up of 19 bones. Similarly, in the leg, the femur attaches to a set of bones of the lower leg, the fibula and tibia. The tibia, or shin bone, is larger than the fibula and forms the joint behind the patella (kneecap) with the femur. At the ankle joint, the fibula and tibia connect to the seven tarsal bones forming the ankle and heel. These, in turn, are connected to the 19 bones that make up the foot. Bones may be classified according to their various traits, such as shape and texture. Four types are recognized based on shape. These are long bones, short bones, flat bones, and irregular bones. The smooth, hard outer layer of bones is called compact bone. Inside the compact bone is cancellous bone, sometimes called the bone marrow. Cancellous bone appears open and spongy, but is actually very strong, like compact bone. Together, these two types of bone produce a light, but strong, skeleton. Even though bones are very strong, they may be broken. Fortunately, most fractures will fully heal with proper care. In children, bones often heal without a trace. Bones are affected by poor diet and are also subject to a number of diseases and disorders. Some examples include scurvy, rickets, osteoporosis, and arthritis. Scurvy results from the lack of vitamin C. In infants, scurvy causes poor bone development. It also causes membranes surrounding the bone to bleed. Rickets is a children's disease resulting from a deficiency of vitamin D. This vitamin enables the body to absorb calcium and phosphorus. Without it, bones become soft and weak and actually bend, or bow out, under the body's weight. body's calcium level is low and calcium from bones is dissolved into the blood to maintain a proper balance. Weak, brittle bones dotted with pits and pores are the result. Another condition commonly afflicting the elderly is arthritis, an often painful inflammation of the joints. Arthritis is not, however, restricted to the elderly, as even young people may suffer from this condition. Arthritis basically involves the inflammation and deterioration of cartilage and bone at the joint surface. I found this article very helpful. It is my first year of advanced college biology for the healthcare field and I have a report due on the skeletal system. This page isn't very detailed but it definately gives me an outline to work with. it is a good topic for medical student ,, when a medical student read this topic he feals good he can gain more knowledge from it . why do footballers break their legs as a result of a harsh tackle while playing? This is a good article with all the basics. However, I didn't get my questions answered: how long does it take for bone to decompose? Can skeletons be moved once a person is buried (ie: archaeological digs) and how long before bone matures as babies grow? Article is very much informative. I just want to know that I have been found with a new bony structure within my wrist joints. I am in a very painful condition. The doctors have recommended me for ultrasound therapy but still I am not satisfied with it. Kindly sugest me wether there is any proper treatment for it excluding the surgery. HI this is April and I have to learn how the main organs work together. What are the main organs ? What does the main organs do? I have had groin and pubic bone pain for 6 months now and I recently had an MRI and I have a vertical fracture in my sacral bone in my back. Would this be connected to my groin discomfort? I have been referred to an Orthopedic surgeon but that could take months to get in to see him or her. It seems that the more active I am the worse the pain gets just from getting in and out of the car. Would appreciate any answers you can provide. Ahhh thank you! Very useful, a great reference too! this is an excellent article, helped me a lot on my assignment.